Directed by Amy-Joyce Hastings, ‘QED’ has picked up another award win on its festival journey since its premiere at the Galway Film Fleadh last year. Donna Anita Nikolaisen, who plays the emotionally and physically challenging lead female role in the film, has won an award for her performance at the 9th Underground Cinema Awards, held last weekend in Dun Laoghaire. Donna is best known to Irish audiences for her four year stint as Zambian nurse Ama Chisenga on RTE’s ‘Fair City’. Billed as a stylish urban drama with deep emotional resonance, ‘QED’ tackles the controversial and difficult subject of euthanasia. It tells the story of Jack and Ali - a happily married couple until a terrible accident shatters their perfect world. QED explores the ultimate ethical quandary of what we will and won't sacrifice for the person we love. The film is one of the last shorts ever to be produced by Filmbase, which closed its doors earlier this year. It won Best Overall Short Film at the prestigious 17th Santa Fe Film Festival in February of this year and also won a Golden Palm Jury Award for Narrative Short at the 2018 Mexico International Film Festival. Its director Amy-Joyce Hastings was one of several female filmmakers nominated for Best Emerging Female Director at the IndieCork Film Festival last month. She was a special guest of the San Francisco Irish Film Festival in September, interviewed by Professor of Irish Studies at UC Berkeley, Prof Catherine Flynn and supported by Culture Ireland. QED was selected for this year’s Cannes Short Film Corner and has been nominated and screened at numerous festivals all across Europe and North and South America, as well as many at home. ‘QED’ is actress Hastings' fourth short film behind the lens - she co-wrote the screenplay with lead actor Michael O'Kelly (‘Red Rock’). 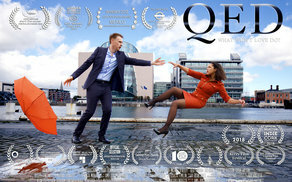 ‘QED’ was shot on various locations in and around Dublin. It features actors Norma Sheahan (‘Handsome Devil’), Charlene Gleeson (‘Penny Dreadful’) and Steve Wilson (‘Vikings’) in supporting roles. Trisha Flood, Danielle Collins, Jannik Ohlendieck and Michael O'Kelly produced, with Alan Fitzpatrick, Graham Cantwell and Alice Mansergh as Executive Producers for Filmbase and Film Venture, respectively. The multinational crew includes Czech cinematographer Jaro Waldeck as Director of Photography, with Sonja Mohlich as Costume Designer, Marina Granville as Key Makeup and Hair Artist, and Jessica Timlin and Alekson Lacerda Dall’Armellina on production design. The score was created by two time Emmy-nominated composer Joseph Conlan and post production sound was headed up by IFTA winning Dean Jones at Raygun Sound.